Trenches at the Airport East trench site exposed geologic evidence for three surface-faulting earthquakes on the Taylorsville fault. The fault plane is visible between the two red arrows in the center of the photo. Photo taken on September 2, 2015. The West Valley fault zone is the lesser known of the two major faults that run through the Salt Lake Valley (the other is the Salt Lake City segment of the Wasatch fault zone). The Salt Lake City segment has been well studied, but much less is known about the West Valley fault zone.The West Valley fault zone consists of two, subparallel main traces, known as the Granger fault (western trace) and Taylorsville fault (eastern trace). In 2011, the Utah Geological Survey (UGS) completed an investigation that analyzed the relation between the Granger fault and Salt Lake City segment to try and determine a link between major earthquakes on the Salt Lake City segment and the West Valley fault zone (see Survey Notes, v. 44, no. 2, 2012). The purpose of our current investigation is to expand our knowledge of the earthquake history for the lesser studied Taylorsville fault. 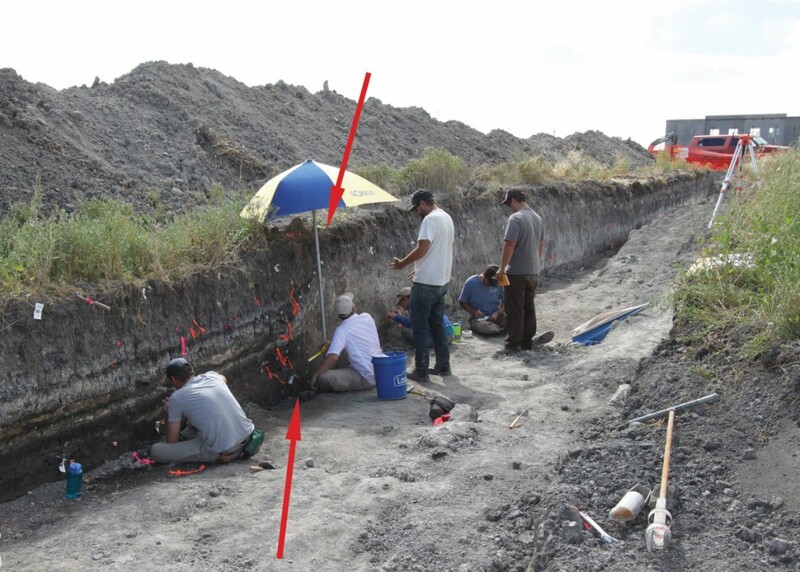 In August 2015, the UGS, aided by the U.S. Geological Survey (USGS), conducted a paleoseismic (fault trenching) investigation of prehistoric surface-faulting earthquakes on the Taylorsville fault. Two parallel trenches were excavated at the Airport East site across a 1 to 3 foot high scarp, east of the Salt Lake City International Airport at approximately 1140 North Flyer Way. The trenches exposed fine-grained sand and silt deposits. Groundwater at the site was very shallow, which was problematic for trench wall stability and prevented us from trenching deeper to expose older deposits that might record a more complete earthquake record. Our preliminary findings include evidence for three post-Bonneville earthquakes at the Airport East site and distinguish seven separate units in the trench wall. These units consist of sand and silt deposits, probably deposited on the paleo-Jordan River floodplain and Great Salt Lake margin marshes over thousands of years. Several liquefaction-induced sand dikes and broad warping of older units indicate evidence of possibly two separate earthquake ground-shaking events. However, we found no evidence to link these features to the Taylorsville fault; the features could have been created from ground-shaking from an earthquake on any one of the many regional fault systems. We collected samples for both radiocarbon (14C) and optically stimulated luminescence (OSL) dating methods. Several units in the trench were very organic rich and one contained a burn horizon. The abundance of organic material allowed us to collect samples with numerous discrete charcoal fragments, which makes dating the material easier. The samples are currently being processed, and we are awaiting results. We will use the data to develop a model for the timing of prehistoric earthquakes at the Airport East site, as well as refine data from past trench investigations. These data will help us better understand the complex relationship between earthquakes on the West Valley fault zone and the Salt Lake City segment, increase our knowledge of the entire Wasatch fault zone, and will eventually be incorporated into the USGS National Seismic Hazard Maps that are part of the International Building and Residential Codes adopted in Utah. Research projects such as this allow us to better plan for and accurately characterize earthquake hazard in the Salt Lake Valley. Funding for this project was provided through the USGS National Earthquake Hazards Reduction Program (NEHRP). Additional information on the link between the West Valley fault zone and Salt Lake City segment of the Wasatch Fault zone can be found in UGS Special Study 149, Paleoseismology of Utah, Volume 24—Evaluating surface faulting chronologies of graben-bounding faults in Salt Lake Valley, Utah—New paleoseismic data from the Salt Lake City segment of the Wasatch fault zone and the West Valley fault zone, by Christopher B. DuRoss and Michael D. Hylland, available on our Paleoseismology of Utah Series web page.